Hazelnuts are one of my favorite nuts around, especially for dessert. 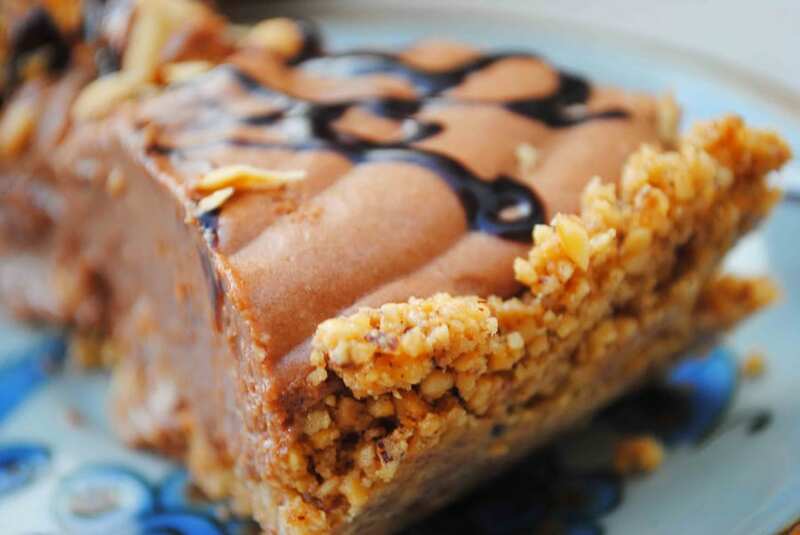 I love that this pie is made with a hazelnut crust. I whirl my hazelnuts in in a food processor for a minute or so until they become crumbs. Then mix this with brown sugar and butter to make a yummy crust. The filling is simple. Chocolate chips melted with butter and folded into fresh whipped cream. I have used dark chocolate chips and I do like the pie with them, but my kiddos prefer milk chocolate, so that’s what I use mostly. It’s completely up to you and your personal preference. It’s one of the many reasons I love this pie! In college we used to make this Hershey Bar Pie often and its filling followed the same basic recipe. I cannot for the life of me find that recipe anywhere! I have no clue where it came from, but the filling with butter melted in always made a very creamy chocolate that held it’s own but wasn’t too dry. I use Ghirardelli Chocolate Chips, they taste amazing and are really easily found in the baking aisle. For hazelnuts I prefer roasted and lightly salted ones for a little more flavor but you can use raw too. The best price I’ve found is at Trader Joe’s. They have a huge bag of them and the leftovers keep in the freezer for your next pie. 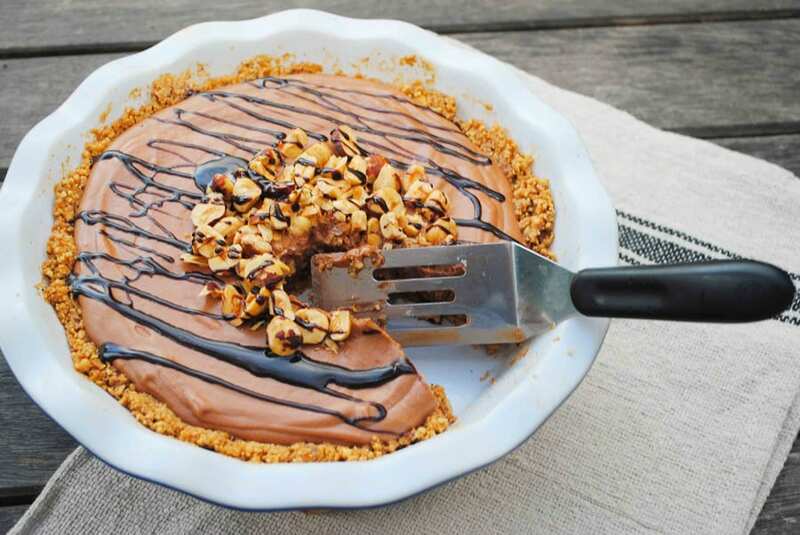 Chocolate Hazelnut Pie is really very easy to pull together and keeps in the fridge for days. The longer it sits in the fridge, the better. Essentially this pie is gluten free. It does have two tablespoons of powdered sugar and while MOST powdered sugars are gluten free there are some that aren’t so I hate to make a blanket statement. I love this twist on chocolate pie. The nuts add a great salty depth to the chocolate, it would be great served at the holidays with a nice cup of coffee. As always I am obsessed with my Emile Henry deep dish pie plate. You can get one here: http://theanchoredkitchen.com/emilehenrypie The deep dish pie plate is perfect not only for pies but breakfast casseroles as well. It holds a lot of filling. Pour Hazelnuts into a food processor and grind for about one minute. Really watch this. You want the nuts to become crumbs but don't let it go too far or you will have hazelnut butter on your hands. Once the nuts seem finely ground set them aside. Whisk together the brown sugar, salt and melted butter. Pour the hazelnuts into the butter mixture and mix well. Pour the hazelnuts into a 9 inch deep dish pie plate. Press the hazelnuts into the bottom and up the sides of the pie plate, to form an even crust all the way around. Bake in a 350 degree oven for 15-20 minutes. If the side fall while baking, just let the crust cool for about five minutes then press it back into place. Allow this to cool to room temperature before filling. Whisk the heavy whipping cream with a whisk attachment on a hand mixer in a large bowl. Once the cream starts to come together and thicken add in the powdered sugar. Continue to whisk until the cream forms stiff peaks. In a microwave safe bowl (or over a double boiler if you don't want to microwave) pace the butter and the chocolate chips. Microwave on high for 20 seconds. Take out the bowl, stir, then microwave again for 20 seconds. Continue to follow these steps until the chocolate chips have completely melted and the the mixture is smooth. This only takes about 1 minute. Carefully fold the chocolate into the whipped cream. See my video below on folding. Once everything is evenly mixed, pour the chocolate mix into the pie crust and spread out evenly with your spoon. 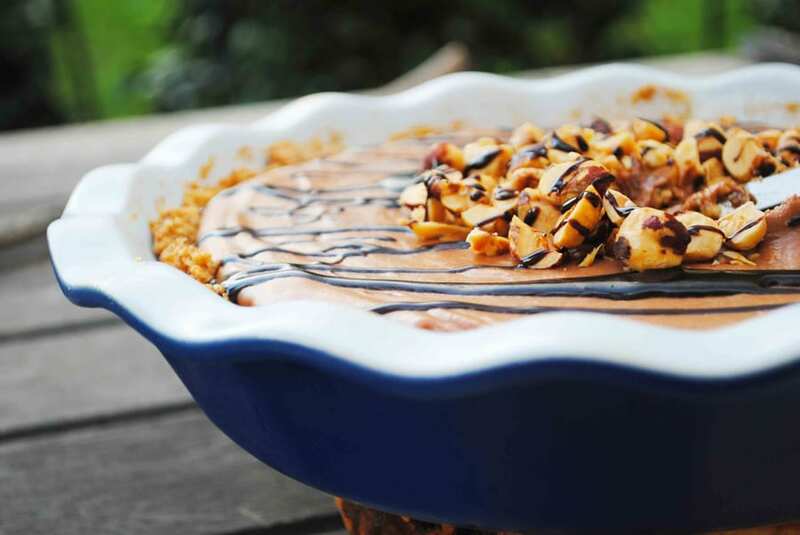 Top with the 1/4 C hazelnuts and spread the hot fudge sauce over the top with a spoon to create a nice drizzle.